. :: PENELOPE LEPREVOST DRIVES AWAY WITH A CITROEN DURING THE PARTNER PFERD FEI WC QUALIFER IN LEIPZIG ::. LEIPZIG – AT FIRST ROGER YVES BOST, NOW PENELOPE LEPREVOST – NUMBER ELEVEN OF THE CURRENT WORLD RANKING LIST OF THE JUMPING RIDERS FROM FRANCE WON THE PREIS DER CITROEN PARTNER LEIPZIG, THROUGH THIS ALSO A BRAND NEW CAR. THE DIFFICULT, CLASSICAL COMPETITION AT THE SAME TIME WAS ALSO THE QUALIFICATION FOR THE WORLD CUP COMPETITION ON SUNDAY – THE ROLEX FEI WORLD CUP JUMPING, PRESENTED BY SPARKASSE, SPARKASSEN CUP – GROßER PREIS VON LEIPZIG. AND ALSO THE DRIVERS OF THE FOUR-IN-HAND AND THE VAULTING ACROBATS ON THE HORSEBACK ALSO GET INTO THE TOPIC WORLD CUP. Originally Leprevost had planned it differently: “Actually I wanted to ride another horse but I thought it wasn’t in excellent form. Certainly, now I’m satisfied.” Especially as her life partner Kevin Staut – the European champion of 2009 – also gained place three with Silvana Hdc. Marco Kutscher (Riesenbeck) with the ten year old Spartacus, with which he already won the Großen Preis of Oslo in autumn, barged in between the French “Dream team“. 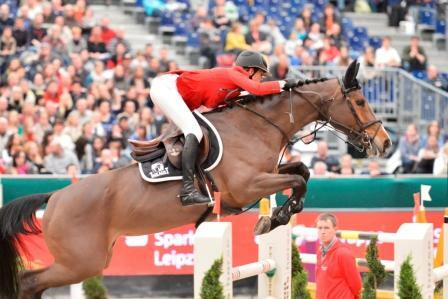 Altogether, 29 female and male riders have been pre-qualified for the world cup competition on Sunday and eleven starting places had to be allocated during the Preis der Citroen Partner Leipzig, in order to achieve the maximum number of 40 world cup places on Sunday. For this 150,000 euro competition, then the following German jumping riders made it: Jörg Naeve (Bovenau), Felix Haßmann (Lienen), Torben Köhlbrandt (Ibbenbüren) and Tim Rieskamp-Goedeking (Steinhagen). The first world cup round of the four-in-hand in the Sparkassen-Trophy was won by the fast Swede Tomas Eriksson in front of the Dutchman Ijsbrand Chardon and his countryman Koos de Ronde. This is important as the Sparkassen-Trophy decides about the start succession during the world cup qualification on Sunday. This will be the eighth and last station before the final...Now it will be possible for Tomas Eriksson to watch calmly the rounds of his competitors on Sunday before he himself will try to score points, as he will start last. The two German candidates Georg von Stein (Modautal) and Christoph Sandmann (Laehden) will have to start first in the spectacular competition on Sunday. 1st: Roger Yves Bost (FRA) with Castle forbes cosma, 0/51.80 penality points/seconds. 2nd: Mario Stevens (Molbergen) with Little Pezi, 0/54.07. 3rd: Robert Whitaker (GBR) with USA Today, 0/54.97. 4th: Pius Schwizer (SUI) with Coolgirl, 0/55.26. 5th: Philipp Weishaupt (Hörstel) with Urmel, 0/58.33. 6th: Patrick Stühlmeyer (Osnabrück) with Lord Lohengrin, 0/58.77. 1st: Pénélope Leprevost (FRA) with Nice Stephanie, 0 SP/64.40 sec. 2nd: Marco Kutscher (Hörstel) with Spartacus, 0/64.69. 3rd: Kevin Staut (FRA) with Silvana Hdc, 0/64.89. 4th: Luciana Diniz (POR) with Lacontino, 0/65.27. 5th: Manuel Anon (ESP) with Qlymp d'Ivraie, 0/65.55. 6th: Marcus Ehning (Borken) with Plot Blue, 0/65.79.